The folks at Springfield Armory are at it again, as they release a brand new line of AR-15 pistols that are chambered in the hard-hitting .300 BLK just in time for the NRA Annual Meetings. Springfield Armory is obviously very excited about the new announcement and in a recent press release received by ConcealedCarry.com, Springfield gave us some insight on just what this new line of AR's is all about. Take a look. Built with high-end features throughout, Springfield Armory’s exclusive Accu-Tite™ tension system increases the tension between the upper and the lower receivers, ensuring an ideal fit and reducing movement. The upper and lower receivers are forged Type III hard-coat anodized 7075 T6 aluminum. The slender, M-Lok compatible handguard features Springfield Armory’s exclusive, patent-pending, rock-solid proprietary attachment system, with four attachment points anchoring it to the barrel nut. Under the handguard is Springfield’s pinned multi/mode adjustable gas block that will reliably cycle supersonic and subsonic ammo, suppressed or unsuppressed. The crisp, enhanced nickel boron coated GI single-stage trigger is paired with a Bravo Company trigger guard. The smooth-operating heavy tungsten buffer system, GI style charging handle, and Bravo Company Mod 3 pistol grip are all well-proven in previous SAINT rifle models. To ensure durability, the M16 BCG’s bolt is precision-machined from Carpenter 158 steel, shot peened, magnetic particle inspected and finished in super-hard Melonite. This combat-grade SAINT pistol carries a Magpul Gen M3, 30-round magazine. The compact design is the perfect complement to the .300 BLK round making the SAINT AR-15 Pistol an ideal choice for home defense. 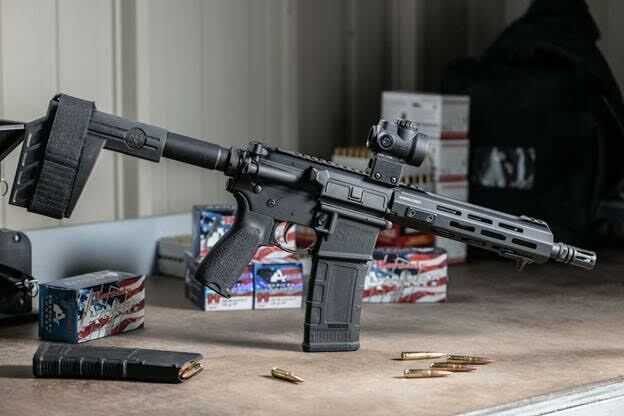 At just 27.75 inches long, and weighing only 5.9 pounds, this new AR pistol in .300 BLK from Springfield Armory delivers a lot of power in a small, fast-handling package. In addition to the above statement, Springfield has also announced the price of this piece of hardware, starting at $989. If you would like more information on this firearm, make sure you check it out on Springfield Armory's website. IS .300 BLACKOUT AN IMPROVEMENT OVER 5.56? Well, that depends a lot on what you're looking to do. But, one of the most important things to keep in mind is that .300 is much more expensive than 5.56/.223 is, so if money is tight, it won't likely work well for you even though it is better suited in some instances as a bad guy stopper. .300 BLK is a heavier round than the average 5.56 is, and because of this, you are going to feel the recoil a bit more. .300 BLK averages about 9 lbs of recoil while the 5.56mm will give you 3 lbs of recoil. Remember, the .300 Blackout is a .30 caliber bullet, and the 5.56 NATO is essentially a .22 caliber bullet. But maybe the most important thing about this firearm, as with most firearms, is the “stopping power” and that is where these two calibers differ the strongest. With a 9″ barrel like Springfield's newest firearm has, the “stopping power” is an impressive 993 ft-lbs of force at 100 yards. Compare that to a 16″ barreled 5.56mm AR and you only get 742 ft-lbs over the same distance. Where the .300 BLK really shines is in a home defense scenario where a suppressor can be used to reduce the concussive noise produced by this heavy-hitting round. That's something only you can answer, but you really can't go wrong with either. For shorter range and a bigger punch, you're likely to want to look at the .300 Blackout. Whereas if you are looking for fast fire and little recoil you're gonna want to take a closer look at the 5.56mm, also available on Springfield's website. Do you own any firearms chambered in .300 BLK? If so, let us know your thoughts in the comments below. Craig Martin, thanks a lot for the post.Really thank you! Much obliged. I absolutely LOVE my .300 Suppressed 10.5”. It is a knockdown dragout blast to shoot, and since I reload, it is very cost effective too. Primary home defense backed by a 12GA Tactical 870 with 000Buckshot. Leave a Reply to ellasevistedeblanco Click here to cancel reply.